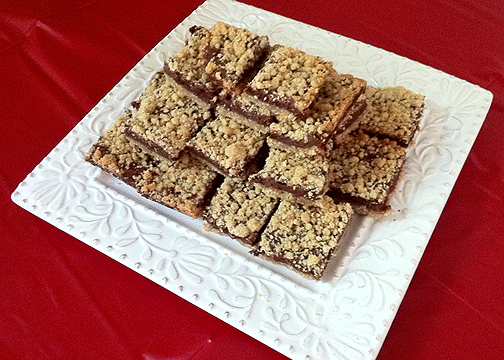 Mid Century Mrs: Chocolate Filled Oatmeal Bars. Every year for the 4th of July we have a BBQ type party and have a bunch of people over for food and fireworks. We happened to pick a great house for 4th of July fireworks. There is a park just a few houses up from us that shoots them off every year. Lately, I've been trying to do more baking and to try out new recipes. So, this year for the 4th I tried out a new bar recipe... They were amazing. Bill said that "this is what chocolate chip cookies should taste like." Lots of chocolate, less of the dough/cookie part. Anyways, I wanted to share this recipe, so that others can enjoy it as well... It's from the Cambridge Lutheran Cookbook. *The real, not imitation chips is totally in the cook book... I'm not sure what sort of "fake" chocolate chips are out there, but I used semi-sweet ones. Mix the butter, sugar and salt together well. Mix in the dry ingredients. Pat 2/3 of the mixture into buttered 10x13 jelly roll pan. Reserve 1/3 of the mixture for the top of the filling. *Make sure the butter is soft or it won't mix well. *When putting bottom crust in pan, pat firmly with a wide pancake turner. Heat in microwave or double boiler the condensed milk and chocolate chips until chips are melted and combined with milk. Stir until well blended; spread on crust in pan and strew rest of crust mixture on top of filling evenly. *Be careful spreading, if you're not, the bottom crust will come up. Bake in 325°F oven until light brown. About 30 minutes. I did bake this for the full 30 minutes, but it will probably depend on your oven. I used a large glass pyrex dish, about the same size as mentioned above. I do think that when and if I make this again, I will make more of the crust, maybe an extra half or even double what the recipe calls for. I feel like the bottom crust could have been a little thicker and I would have liked a little more on top. What I had left for the top didn't completely cover the chocolate. These have been marked with a stamp of approval in my cook book along with some notes. I've also been given the go ahead to make them again at some point. Not Minnesotan? What's a bar?